thanks for the tutorial. keep it up! Hi, for some reason my #10 is outside of the circle, i'm at http://www.wigweaves.com, if you could tell me how to fix that I would appreciate it, email me at lily@lilyseymour.com. What about the popular post gadget on your blog, how can we this style in our blog. My numbers are cut off. I clearly don't know what I am doing. How do I fix? Hope this works. Thanks for visiting! Hi, Is there a way to use the same style for just basic numbering on post? 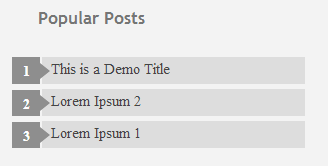 I have two popular posts widgets on my blogger layout, is there a way to customize each of them? The first one I use changed perfectly, but I want to change the other one I have as well! 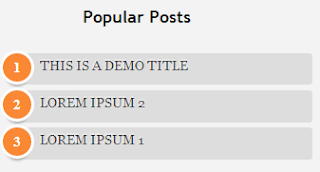 Hey, thanks for codes, I customized almost everything and now I have my widget exactly as I wanted it... the only thing I couldn't do was changing the colour of the text in the snippet... Anyone knows how to do it? Hey...this is so helpful for the new bloggers like me!! Many thanks. Keep it up! 1. 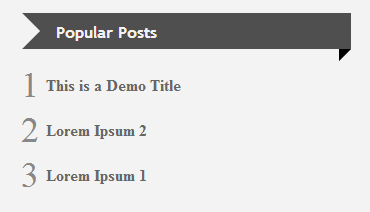 Is there any way to display Popular stand-alone pages in a widget just like posts? 2. What is different between a Page and Post in a blog. 3. From Adsense perspective , which one is better? 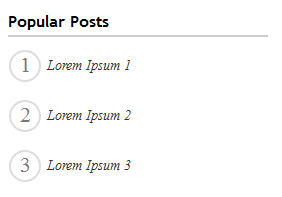 Pages or Posts? Does anyone know why popular posts keeps showing posts outside the range that you picked? 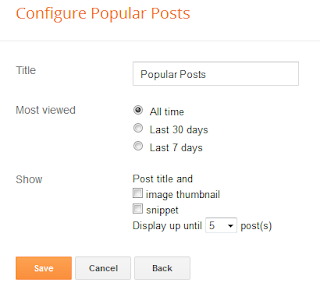 Even if I pick only in the last 7 days...Blogger will show very old posts. And they usually are not even the most popular ones at all. If anyone has any ideas that would be great. not working in my blog :( I'm tired :( can you help me admin? is there a way to make it horizontal? i see alot of other bloggers that have popular posts on the bottom of their page.. after you read a post you scroll down before comment section and there are other popular posts displayed. am i making sense?